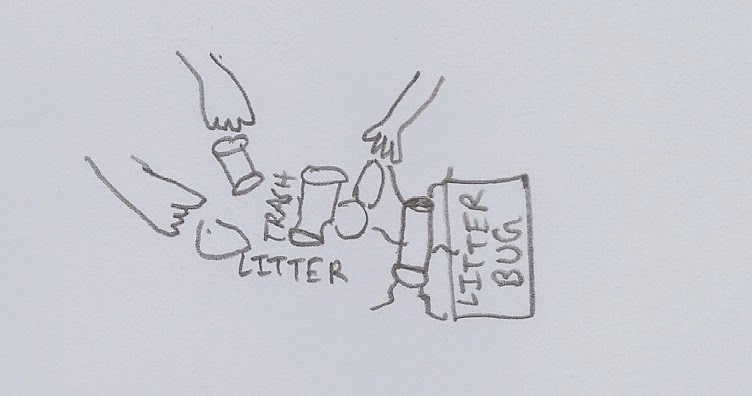 'I am the Great Indian Litter Bug' and one day I will multiply and spread throughout India. No one can stop me, even the educated and the rich people help me to spread out. I give birth to diseases, I spread bad smell and I even block your waterways 'I am the Great Indian Litter Bug'. I feed cockroaches and other insects 'I am the Great Indian Litter Bug'. People throw me everywhere on the road. I multiply at a very fast rate when people throw me on the same place. I am everywhere, outside a house, railway station or a hospital. People who eat 'Guthka' spread me by spitting on the walls and on the roads. People take initiative to kill me but every time they fail. No one can beat me and my growing army of litter bugs in India. I appreciate the people of India who have helped me in spreading here, as in many of the countries I have failed to spread. Some parents even teach their children to spread me by throwing litter on roads from the car in front of them, they do the same and I multiply. I am the king of all bugs ‘I am the Great Indian Litter Bug’. No pesticide, no mosquito coils, no spray or insecticide can kill me. I can live anywhere without oxygen, water or food. I like group of students who eat and throw their waste wrappers on the road. They are so occupied in their talks that they forget the basics of throwing waste in the waste bin and help me multiply. These students help me multiply at a fast rate. I hate those people who throw waste in waste bin, urinate in public toilets they stop me from spreading around. But, these people are very less in number so I am not afraid of them, because a few people cannot stop me from spreading. I love blocking water in waterways and creating problems for people. I am confident, that majority of people will never throw waste in waste bin, will spit and urinate on walls and roads. A day will come, when my army of bugs will be very huge and I will spread throughout India. I will love that day, when people will feel uncomfortable to walk on the roads and there will be no one to disturb me. These people who throw and spread litter all over are my greatest friends and our friendship will last forever and ever. No education or campaigns can break our friendship. I request my friends in India to continue their habit of throwing litter on roads, spitting on walls and urinate outside the public toilets and help me spread throughout India.